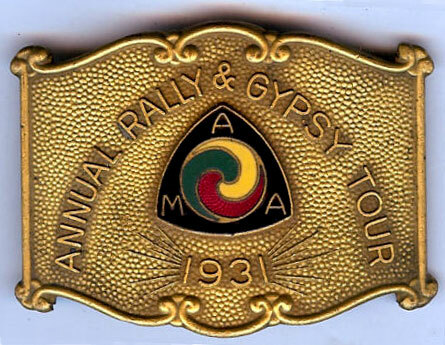 For more information about the early, pre-AMA history of the Gypsy Tour (from 1916-1924), as well as of the Laconia Rally, please click here. 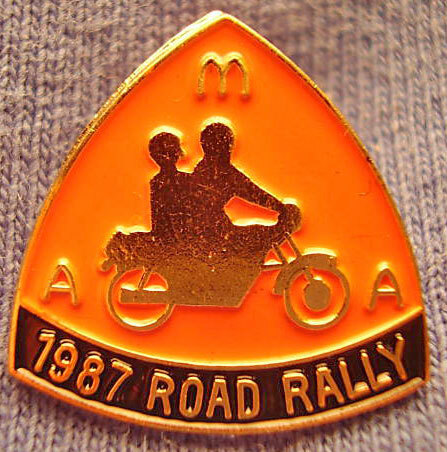 If you will be visiting the Laconia Rally, please stop by the Patio Garden Restaurant at the Winnipesaukee Marketplace in Weirs Beach for lunch, dinner, or a drink. 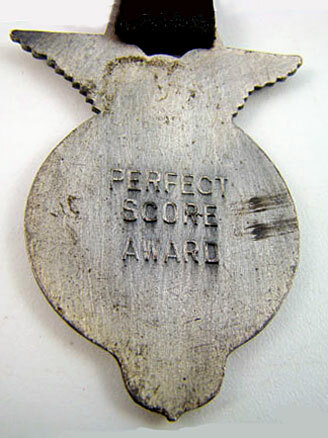 The restaurant’s owner created and maintains this webpage. 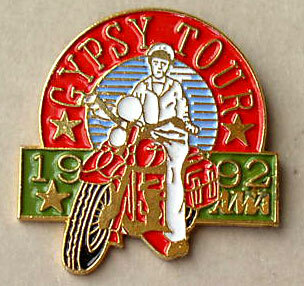 During Laconia Motorcycle Week, Gypsy Tours leave Rally Headquarters to head to various scenic locations. 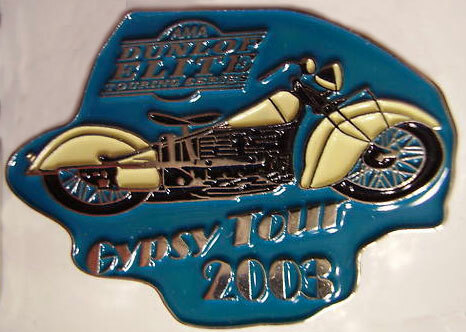 Please check the official website for an exact schedule. 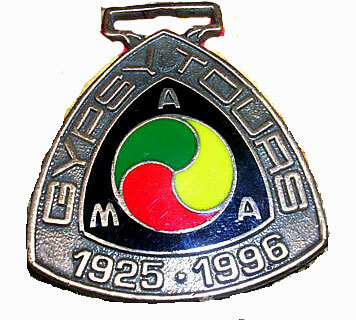 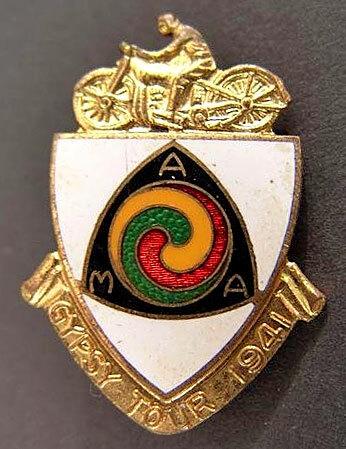 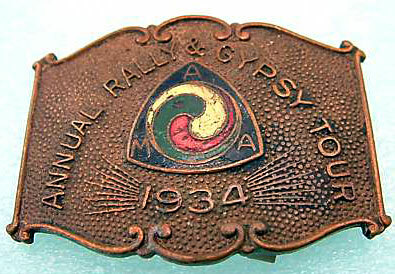 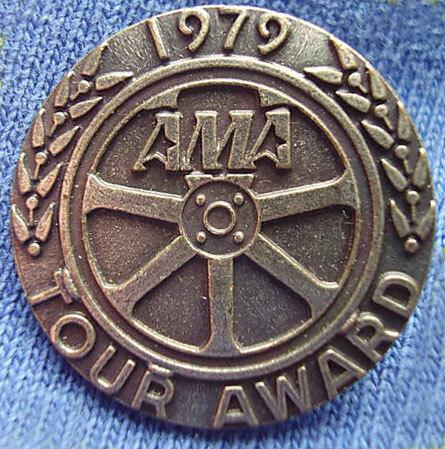 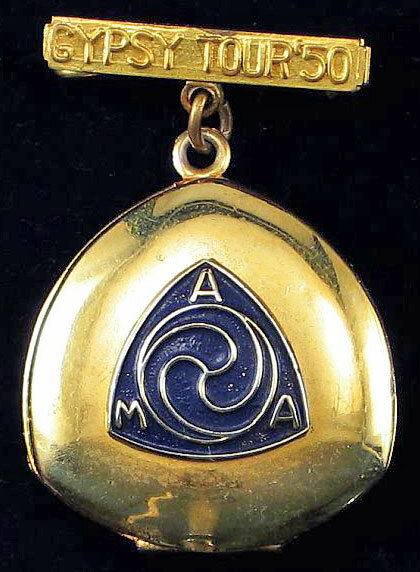 In 1925, the AMA became the official sponsor of the Gypsy Tours. 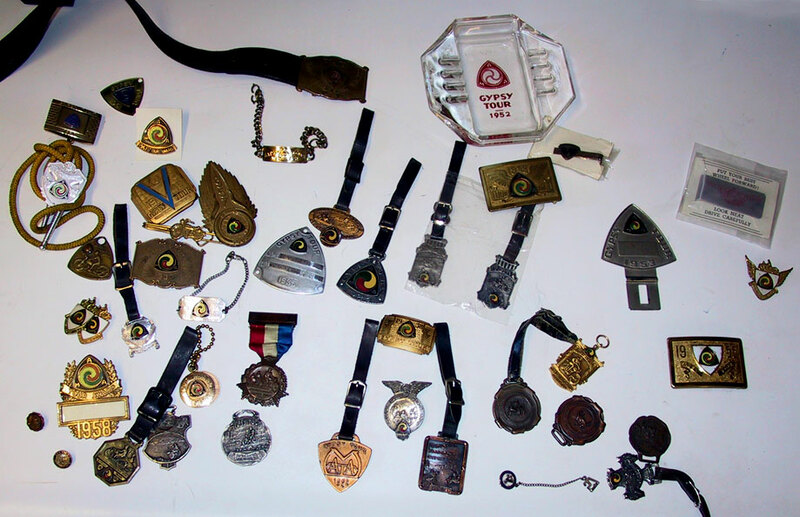 Over the years, many types of souvenir merchandise were produced: watch fobs, pins, key fobs, belt buckles, badges, license holders, ashtrays, bolos, etc. 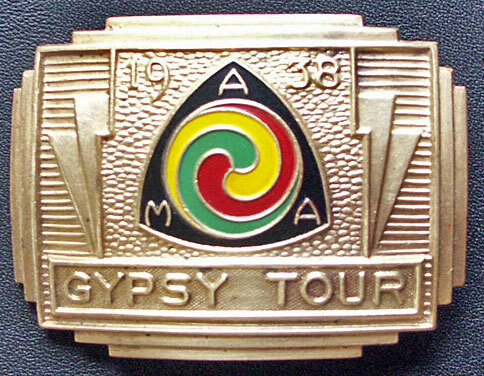 Most of these items shared one common characteristic: the colorful AMA logo and the words “Gypsy Tour”. 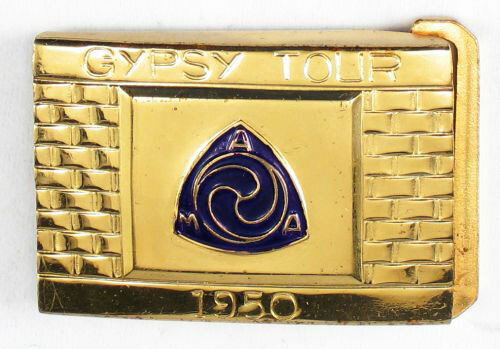 In 1957, the AMA renamed the Gypsy Tours the AMA Tours, and official merchandise dated from 1958 through 1990 lacks the word “Gypsy”. 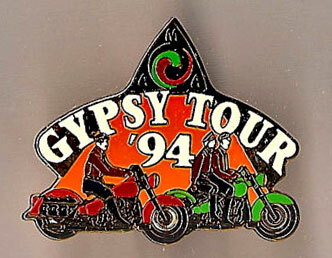 In 1991, the Gypsy Tour was revived by the AMA and merchandise dated from that time onward once again sports the words “Gypsy Tour”. 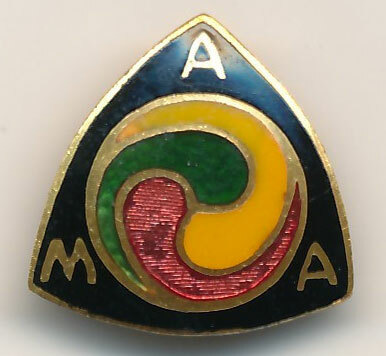 The triangular AMA logo, with its tri-colored, green, yellow and red symbol in its interior, and abbreviated AMA letters at each corner of the triangle, was known as the triad, and was the official AMA logo until 1976. 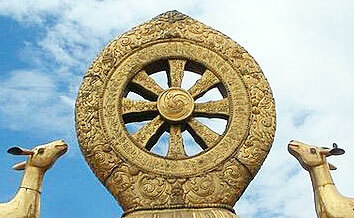 Below are a few sample images of a Dharmachakra with a Gankyil at its center. 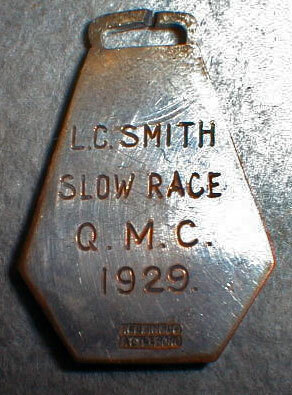 The source for the first image is unknown. 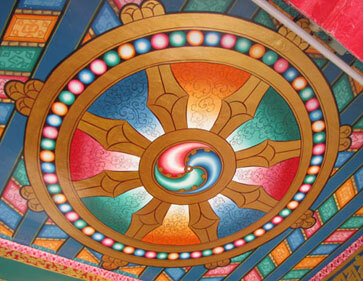 The second image is a ceiling detail from the Library of Tibetan Works and Archives in Dharamsala, India, the home of the Dalai Lama. 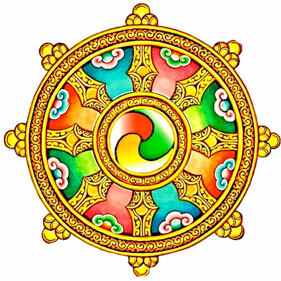 The third image is a detail of a sculpture on the roof of the Jokhang Temple in Lhasa, Tibet – considered the holiest temple in Tibetan Buddhism. 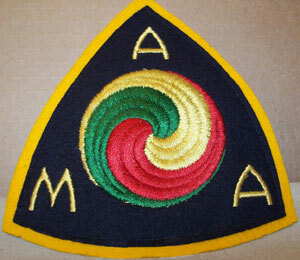 Reproducing and standardizing the triad proved difficult. 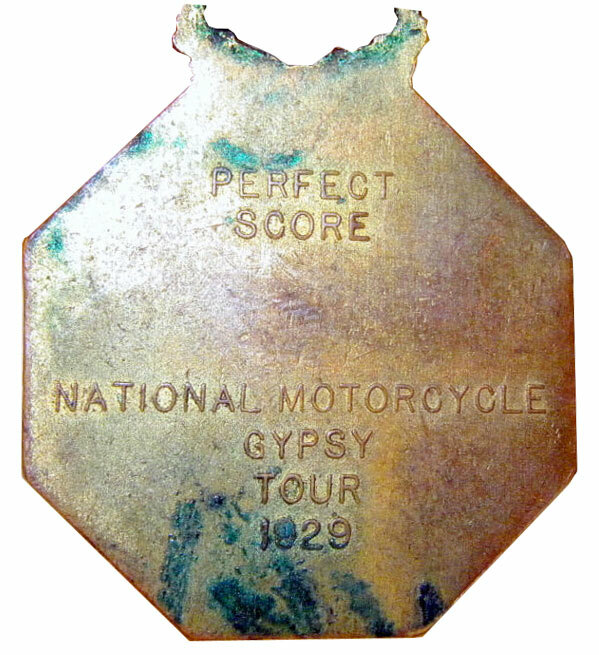 The size, shape and placement of the colored interior tear drops frequently varied. 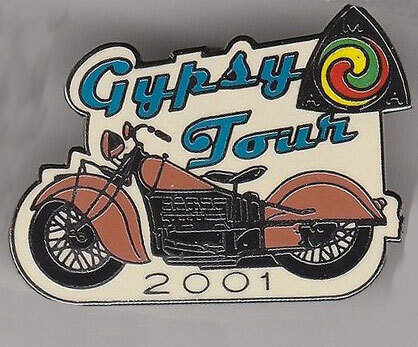 There seemed to be no consistent artistic formula for the logo. 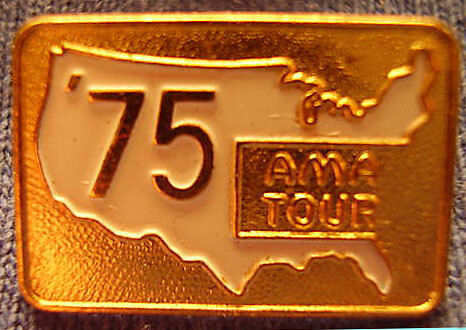 The new, 1976 logo did away with these inconsistencies. 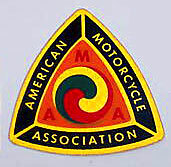 The new logo was rectangular, red,white & blue, and also signaled a change in the AMA’s name from the American Motorcycle Association to the American Motorcyclist Association, which was spelled out in full in the new logo. 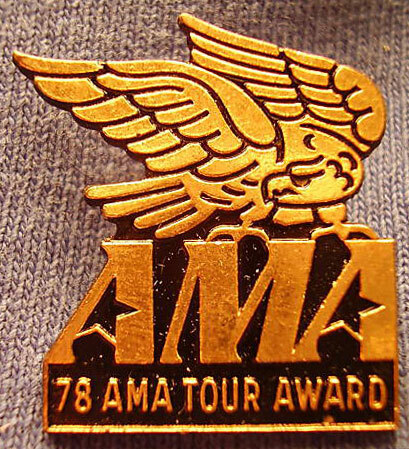 In 2003, the official AMA logo was changed once again. 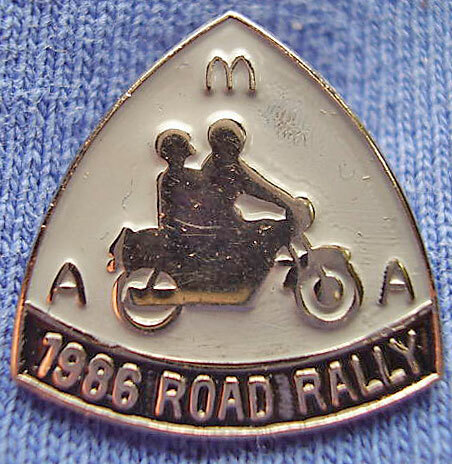 The current logo is shield shaped, and contains the tag line “rights, riding, and racing”. 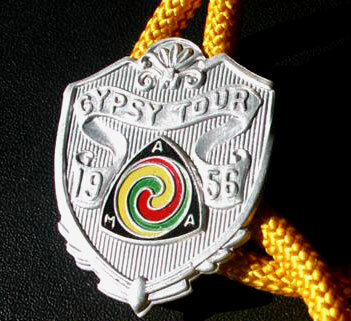 Now, here is the gallery of AMA Gypsy Tour souvenir merchandise. 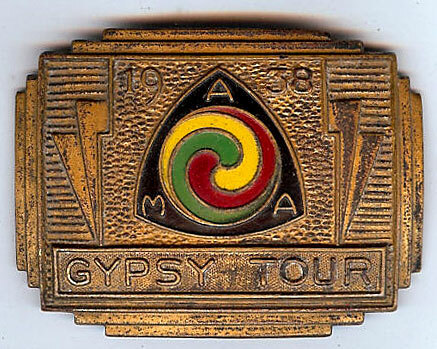 It is the intention of the webmaster to collect, if possible, an image of at least one item for every year since the beginning of the AMA Gypsy Tour. 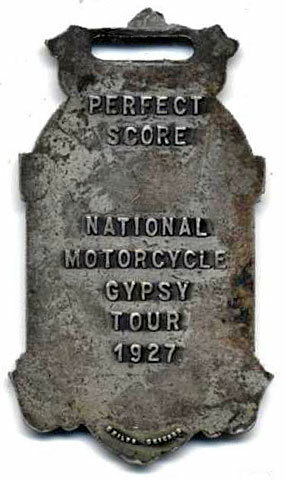 1932 (No wording). 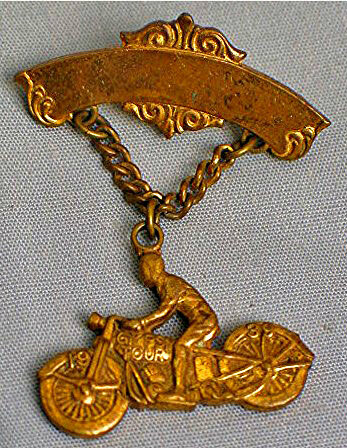 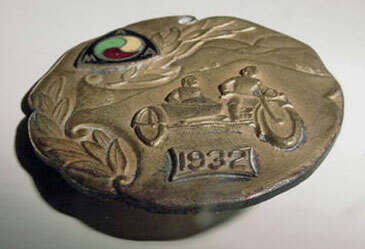 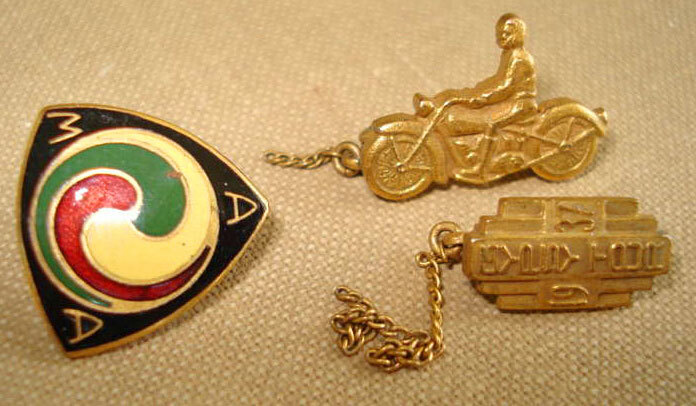 The image of the tandem of a motorcycle “driver” and rider in an attached sidecar had been used frequently since 1917 to decorate Gypsy Tour merchandise. 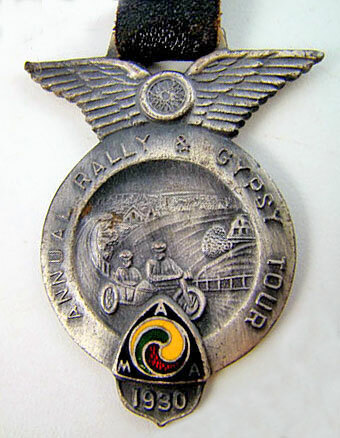 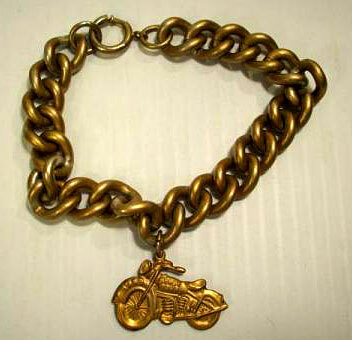 However, after 1932, the tandem image was not seen again on official merchandise for another sixty years, until 1993. 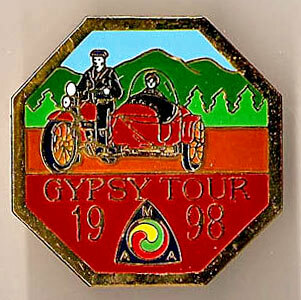 Now, the tandem image invokes nostalgia for the earliest years of the Gypsy Tour. 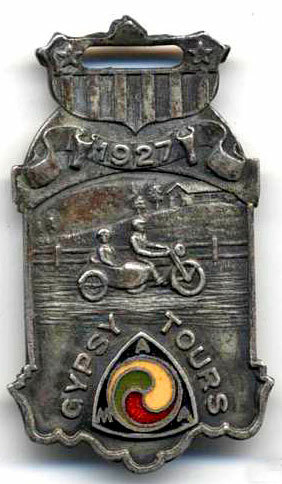 1935 (Gypsy Tour) An article in the rally program for the 1935, 19th Annual Gypsy Tour in Keene, NH, described the following item as a “mudguard identification plate”. 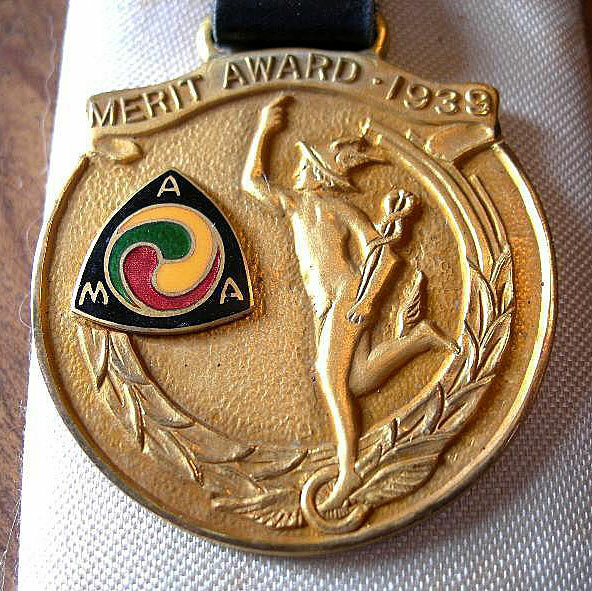 This was the men’s award. 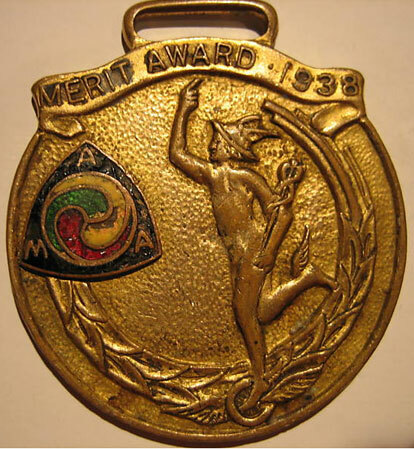 The lady’s award was a compact. 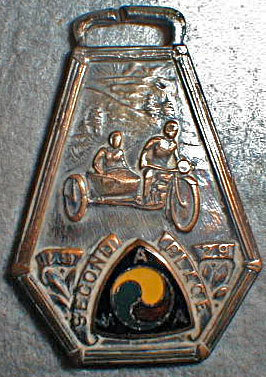 All members in good standing (dues were $1 a year), as well as their sidecars passengers, who registered and completed the Tour, received an award. 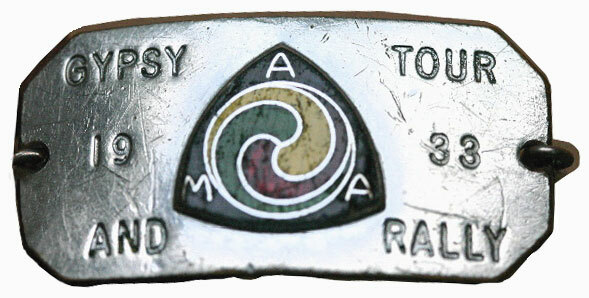 1936 This undated ring was the only souvenir produced in 1936. 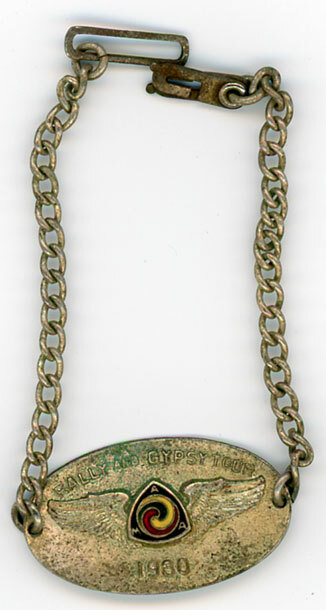 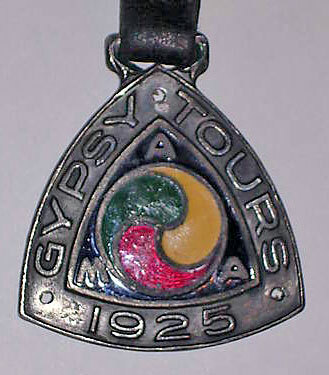 1937 (Gypsy Tour) Produced as a pin or as a charm. 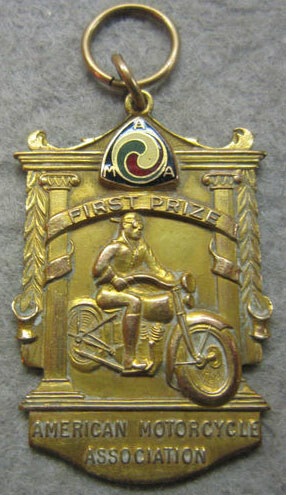 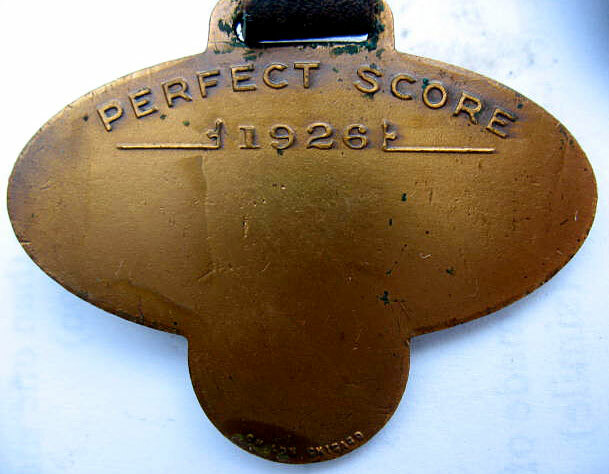 “First Prize” awarded in 1937. 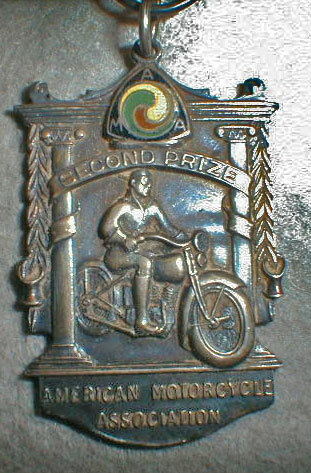 See also the 1935 First Prize and the 1934 Second Prize above. 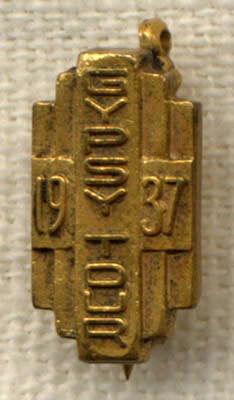 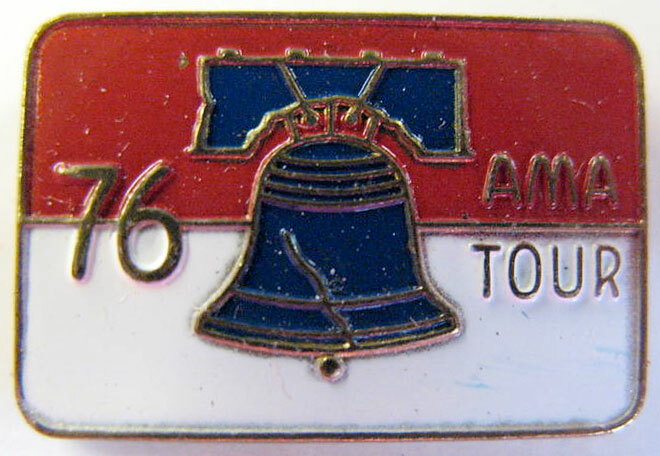 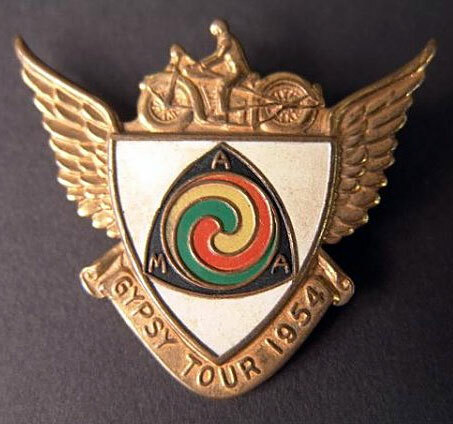 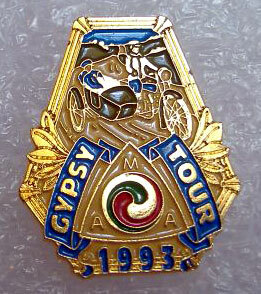 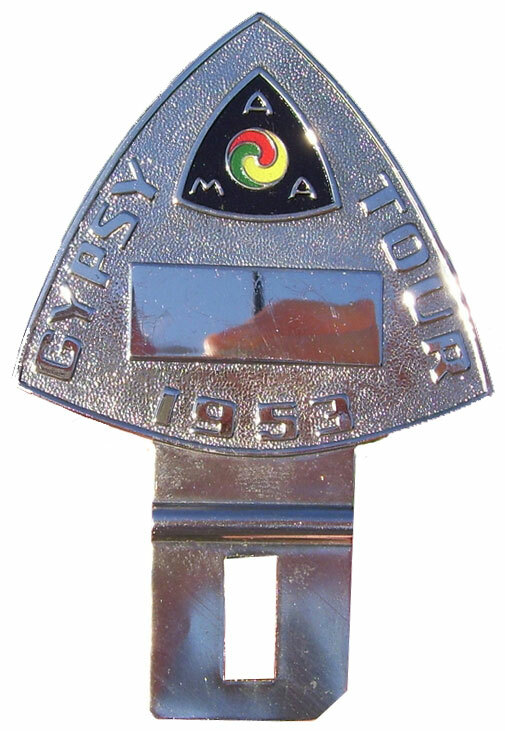 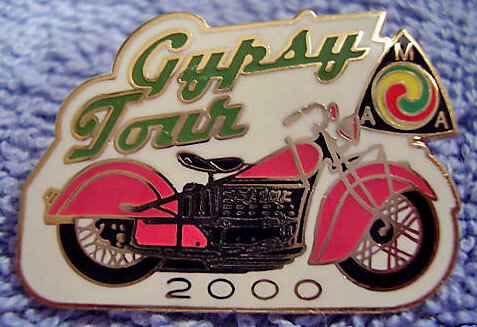 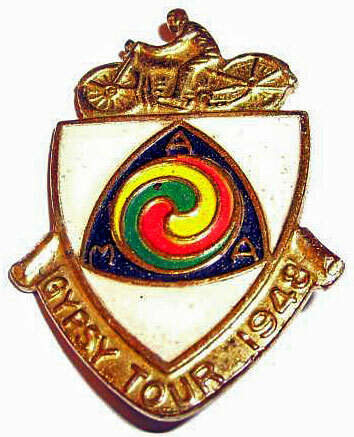 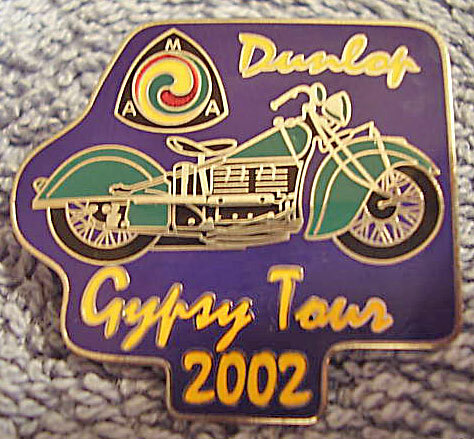 1939 (Gypsy Tour) Shown is the pin. 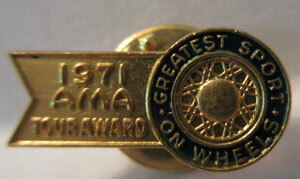 Also produced as a tie bar. 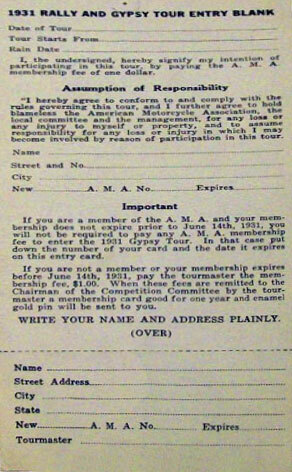 The reverse of the fob read as follows: Finder please drop in any mailbox for return to owner postage guaranteed by the American Motorcycle Association Columbus, Ohio. 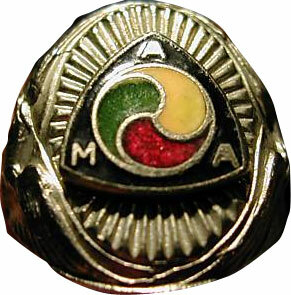 Apparently the AMA kept records to identify each numbered fob as belonging to a particular AMA member. 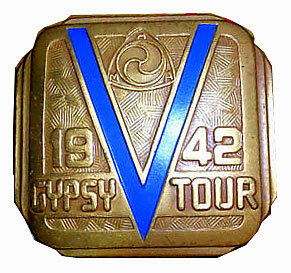 1942 (Gypsy Tour). 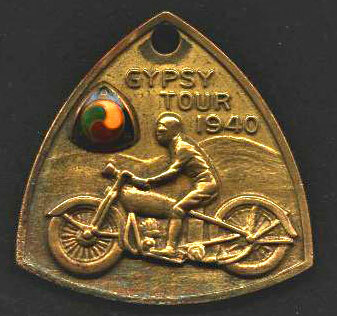 In 1942, because of World War II, many, but not all, Gypsy Tours were cancelled. 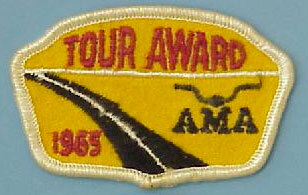 There were tours in Knoxville, TN; Richmond, VA; Redwood Falls, MN; and Cincinnati, Ohio, among other places. 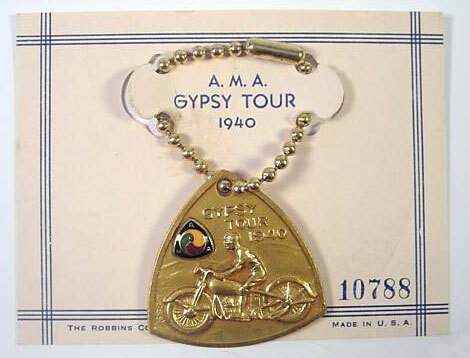 The July, 1942 issue of the Harley-Davidson Enthusiast noted that “The A.M.A Gypsy Tour Award for 1942 incorporates a wartime theme. 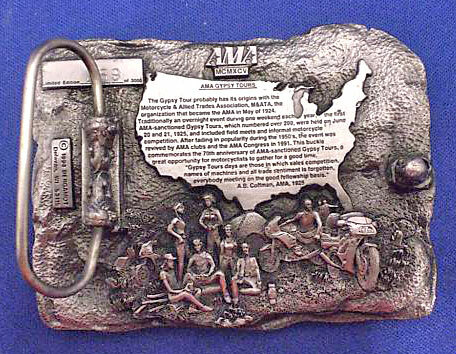 The boys are getting a Victory belt buckle and the girls are receiving a Victory pendant. 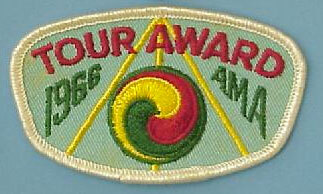 These awards go to paid up A.M.A. 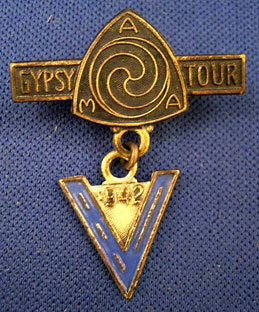 members attending authorized tours.” In this same issue, a photo of the May 15 Gypsy Tour at Knoxville shows the club lined up in the patriotic “V” shape. 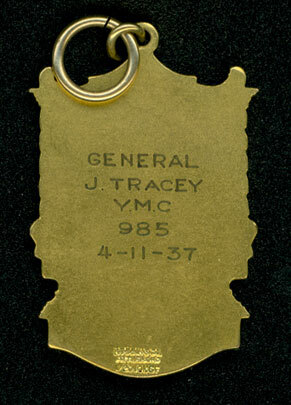 1943-1945 World War II. 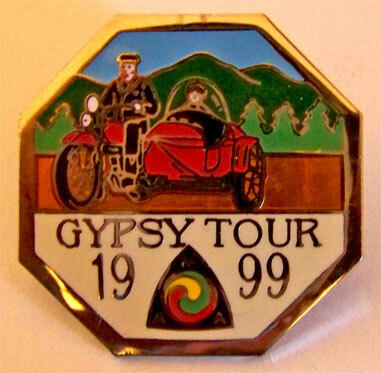 No Gypsy Tour souvenirs were produced. 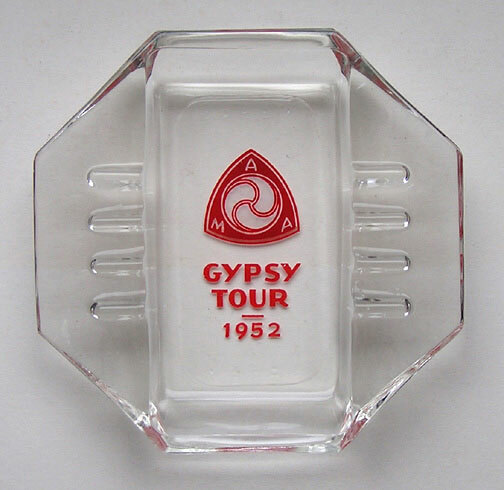 1946 When the Gypsy Tour resumed in 1946, no souvenirs dated 1946 were produced. 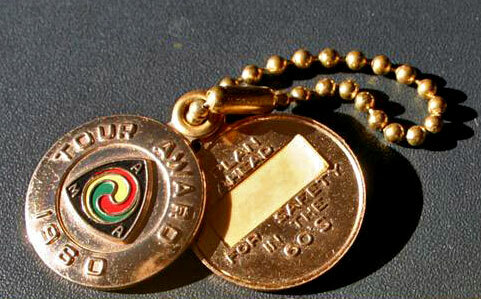 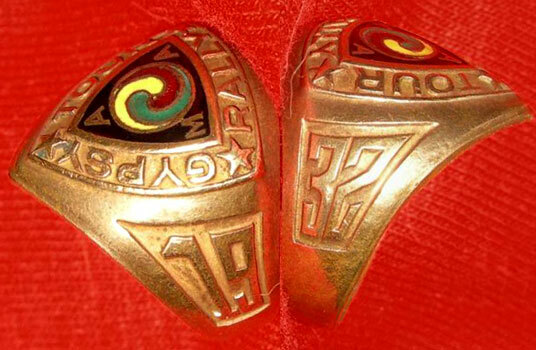 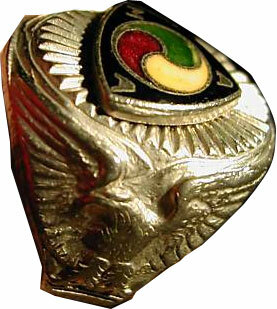 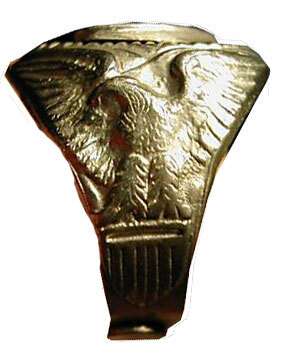 Some sources have indicated that the undated 1936 ring was reproduced for the 1946 Tour. 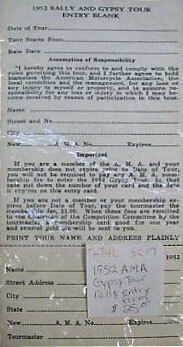 1947 No souvenirs dated 1947 were produced. 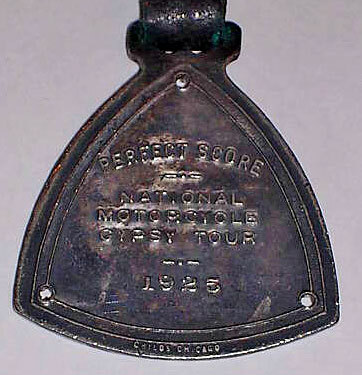 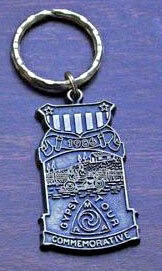 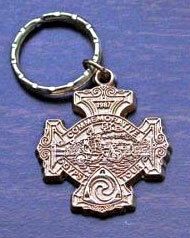 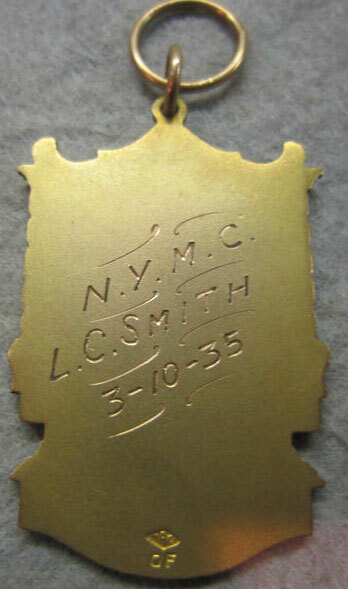 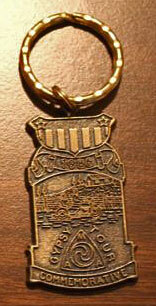 Some sources have indicated that there were undated souvenirs produced in 1947, but there is no evidence. 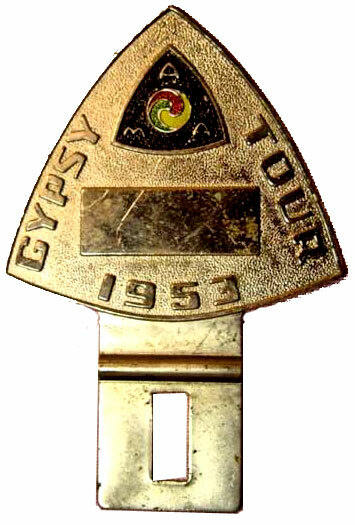 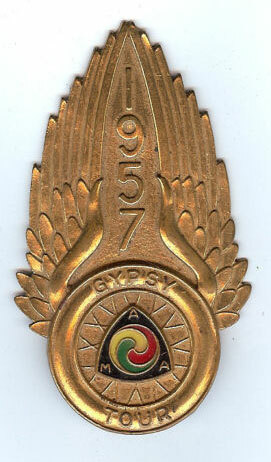 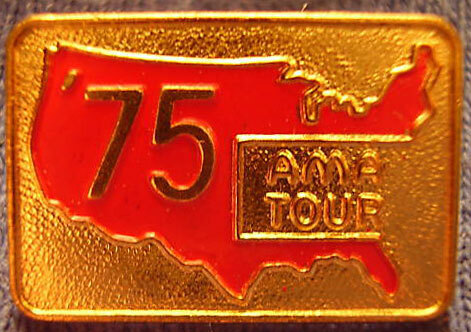 1948 (Gypsy Tour) The 1948 pin copied the 1941 design. 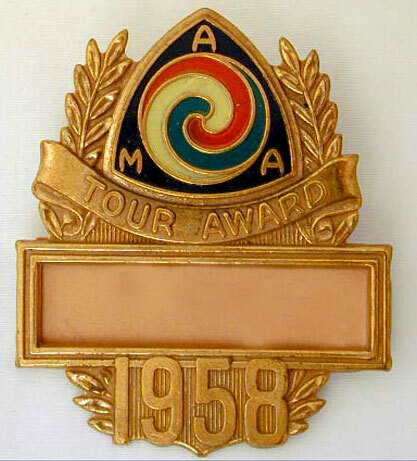 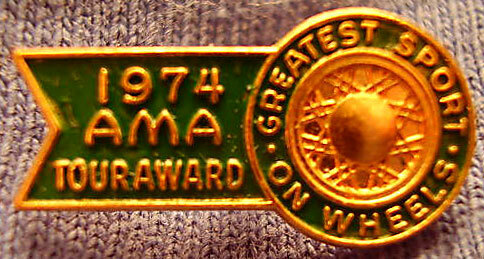 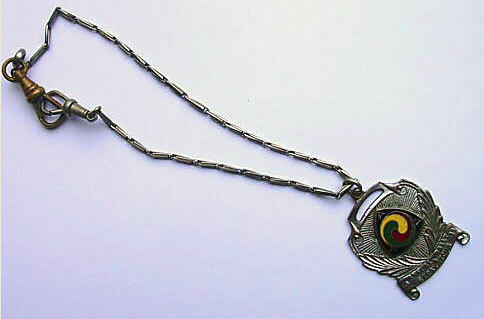 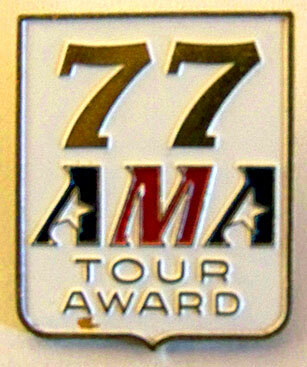 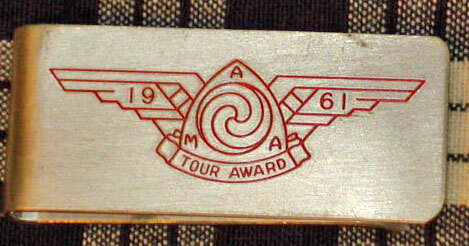 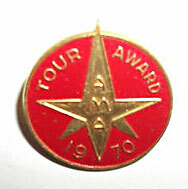 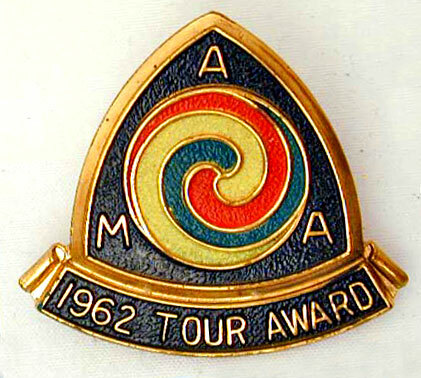 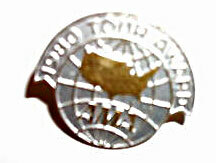 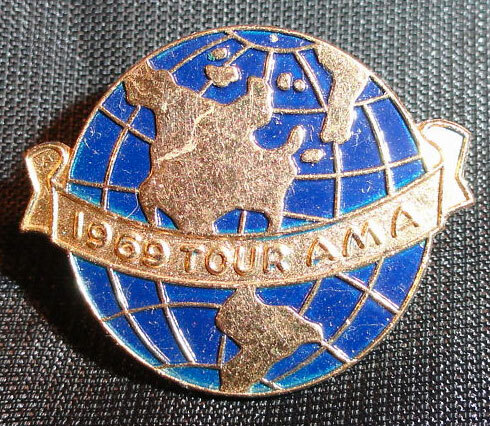 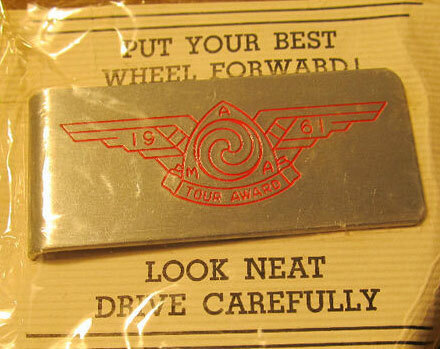 1960 (Tour Award – Plan Ahead for Safety in the 60’s). 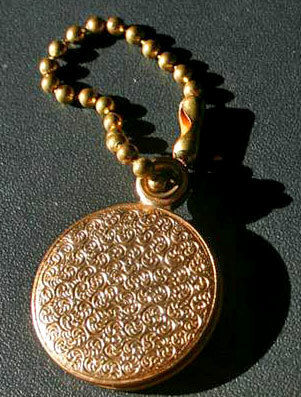 Shown below are three sides of the locket. 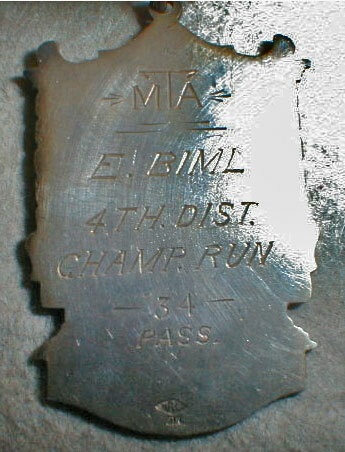 The fourth side (not shown) had a place to put one’s contact info. 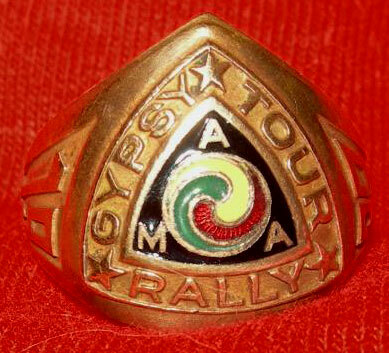 1981 (Road Rally) Before the term Gypsy Tour made a comeback in 1991, the event was called a Road Rally during the 1980’s. 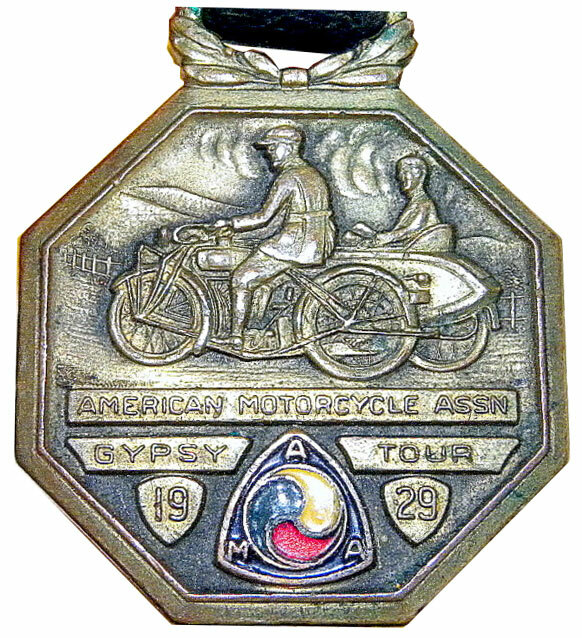 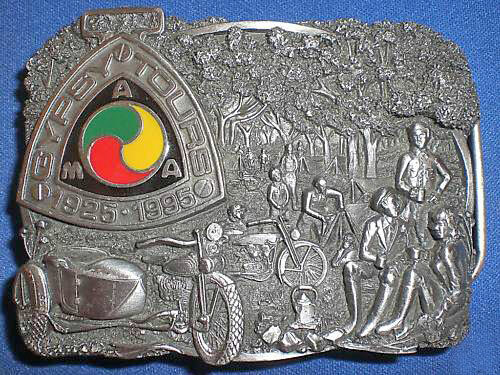 The text on the reverse of the 70th anniversary commemorative buckle reads as follows: The Gypsy Tour probably has its origins with the Motorcycle & Allied Trades Association, M&ATA, the organization that became the AMA in May of 1924. 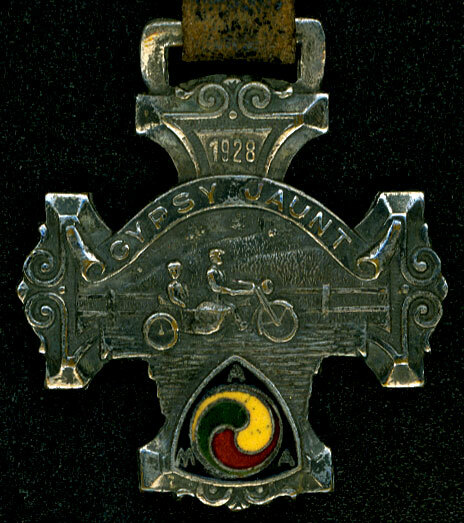 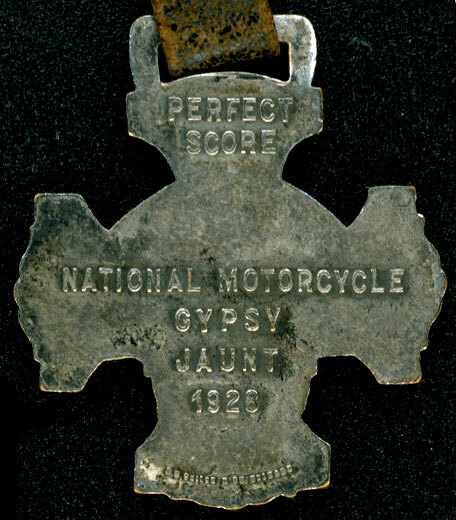 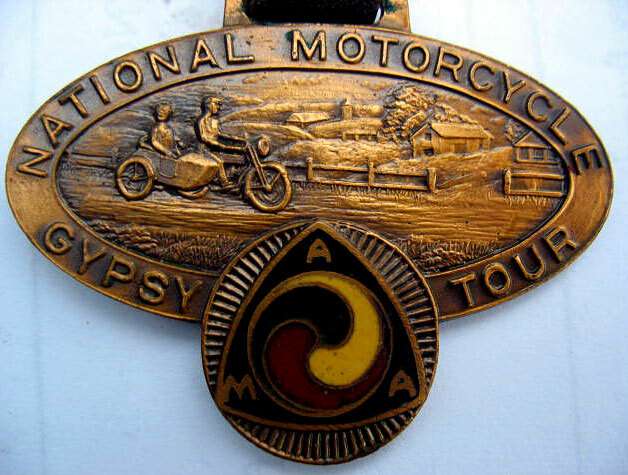 Traditionally an overnight event during one weekend each year, the first AMA-sanctioned Gypsy Tours, which numbered over 200, were held on June 20 and 21, 1925, and included field meets and informal motorcycle competition. 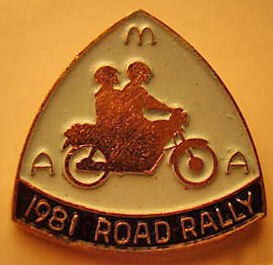 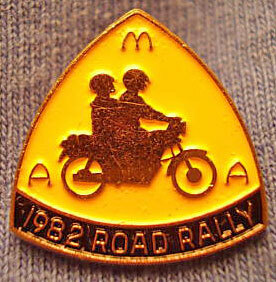 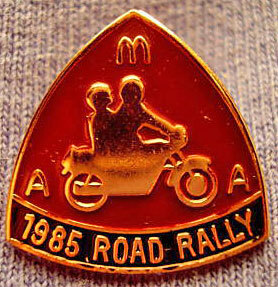 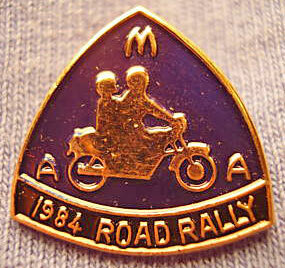 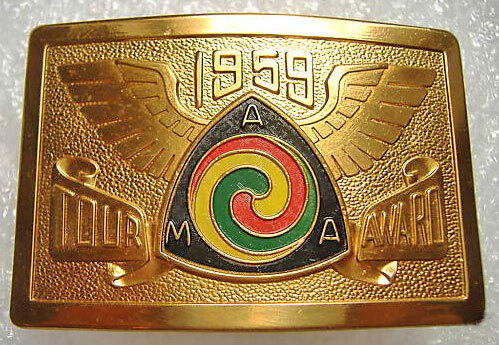 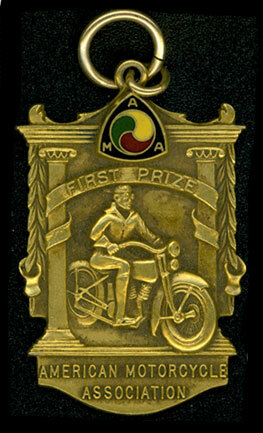 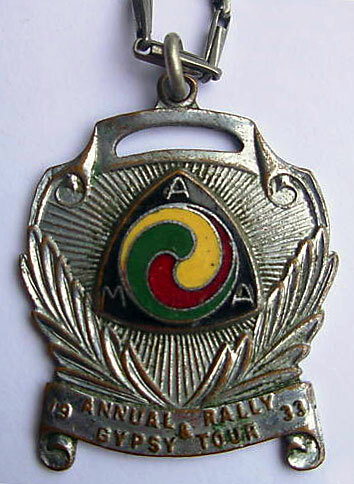 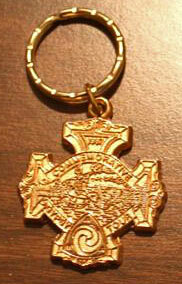 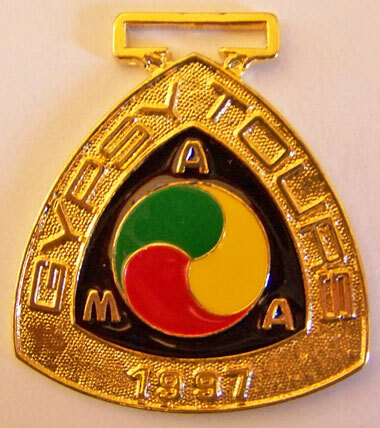 After fading in popularity during the 1950’s, the event was revived by AMA clubs and the AMA congress in 1991. 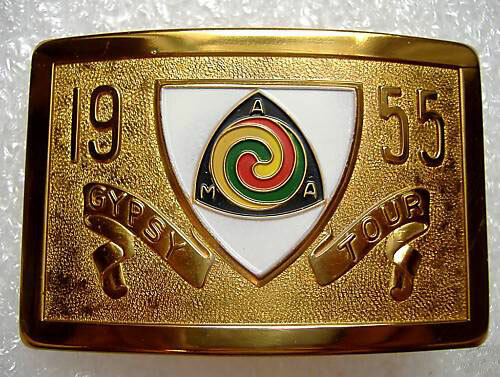 This buckle commemorates the 70th anniversary of AMA-sanctioned Gypsy Tours, a great opportunity for motorcyclists to gather for a good time. 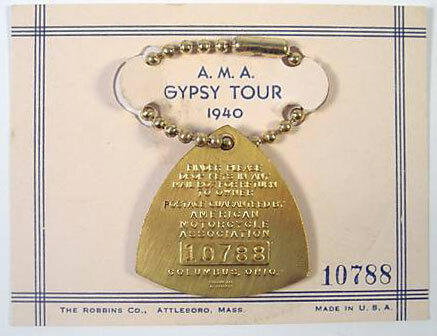 “Gypsy Tour Days are those in which sales competition, names of machines and all trade sentiment is forgotten, everybody meeting on the good fellowship basis.” A.B.Coltman, AMA, 1925. 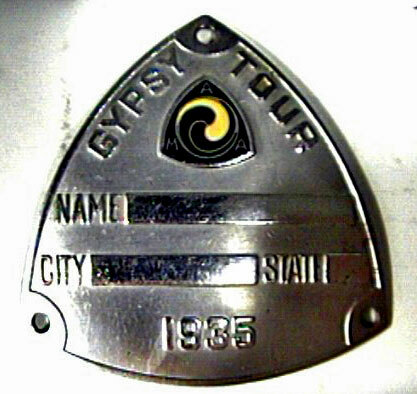 If you have an old Gypsy Tour item that you would like to see added to this webpage, please email a photo to: webmaster@weirsbeach.com. 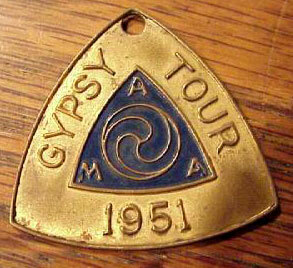 Here is a nice collection of Gypsy Tour items belonging to tattooist Mike Skiver, owner of the Personal Art Studio.